PLEASE READ INSTRUCTIONS BELOW BEFORE REGISTERING. FEES WILL BE ADDED ON JUNE 1, 2019. Program General Information. / Informacion General del Programa. Class from August through May. / Las clases son de Agosto a Mayo . Class is once a week. /La clase es un dia a la semana. First day of class will be published at website July 2019./ El promer dia de clases se publicara en la pagina de internet Julio 2019. Para ninos que quieren continuar aprendiendo a cerca de la Fe Catolica. 2nd-8th choose regular class/ 2nd-7th selecione clase regular. 2 consecutive years required, please register your child each year. 2 años consecutivos sonrequeridos, por favor register cada año. 1st-6th grade choose regular class. /1ro-6to grado seleccione clase regular. 2nd year need to choose First Communion Class/ El Segundo año necesita seleccionar Clase de Primera Communion. Pagar cuota de inscripcion + Actividad de Primera Communion $40.00 por niño en esa clase. Copia del Certificado de Bautismo. Envie por correo electronico o entrege en la oficina de Faith Formation. 7th / 8th grade choose regular class. 7th/8th grado seleccione clase regular. 2nd year please choose Confirmation class./ El Segundo año seleccione clase de Confirmación. Pagar cuota de inscripción + Retiro de Confirmación $70.00 por niño en esa clase. Carta de permiso para ser padrino de la iglesia donde este registrado. 9th -12th grade please choose Confirmation class./ 9th/12th seleccione clase de Confirmación. 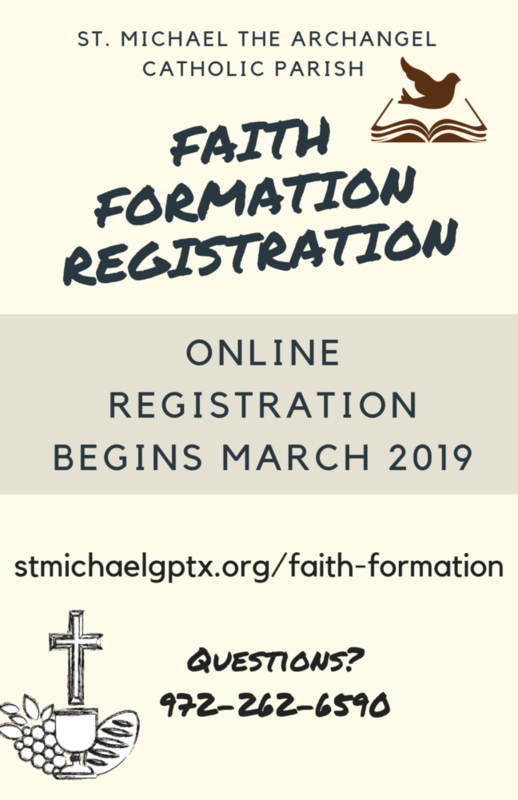 Are you a registered Parishioner/Esta Registrado en la parroquia REQUIRED (Select One) Yes/Si No Please fill out this field. Parishioner ID / Numero de sobre parraquiano Please enter valid data. Father&apos;s Name/Nombre de Papa REQUIRED Please fill out this field. Please enter valid data. Father&apos;s Phone Number/Numero de telefono de padre REQUIRED Please fill out this field. Please enter a phone number. Mother&apos;s Name/Nombre de mama REQUIRED Please fill out this field. Please enter valid data. Mother&apos;s Phone Number/Numero de telefono de madre REQUIRED Please fill out this field. Please enter a phone number. Guardian&apos;s Name/Nombre de guardian Please enter valid data. If no, please indicate where, if not applicable, please put N/A / Si no, donde asistieron? REQUIRED Please fill out this field. Please enter valid data. NOTE: If the child attended another parish, we will need a letter from that parish confirming attendance. NOTA: Si su hijo/a asistio a otra parraquia, deb traer una carte de esa iglesia confirmando la asistencia. Number of Children Registering / Número de niños registrados REQUIRED Please fill out this field. Grade (please enter the grade they will be going into for the 2019-20 school year)/ Grado (2019-20) Por favor, ponga el grado que su hijo entrará en el otoño REQUIRED Please fill out this field. Please enter valid data. Date of Birth/Fecha de nacimiento REQUIRED Please fill out this field. Please enter valid data. Age/edad REQUIRED Please fill out this field. Please enter valid data. Baptized? REQUIRED (Select One) Yes/Si No Please fill out this field. Received First Holy Communion/Primera Comunion? REQUIRED (Select One) Yes/Si No Please fill out this field. $0 – STUDENT DOES NOT FIT INTO CATEGORY Please fill out this field. Received Confirmation/Confirmacion? REQUIRED (Select One) Yes/Si No Please fill out this field. Adult(s) allowed picking up student (other than parents)? Please note, if you do not include a name, then it is assumed NO ONE else is allowed to pick them up. REQUIRED Please fill out this field. Please enter valid data. My Child/ren Can Drive Home | Mi hijo / a puede manejar a la casa REQUIRED Please fill out this field. Please enter valid data. Does your child have any medical conditions? | ¿Su hijo tiene alguna condición médica? REQUIRED Please fill out this field. Please enter valid data. PAYMENT INFORMATION - Select How Many Students You Are Registering. $204 – 4 Children Please fill out this field. Are photos of your child(ren) ok? ¿ Podemos tomar fotos de sus hijos en eventos? REQUIRED (Select One) Yes No Please fill out this field. If you have any comments on this form, please include them here. Si tiene algún comentario sobre este formulario, inclúyalo aquí. I Agree | Estoy de acuerdo Please select this field. The office is also open evenings while classes are in session.